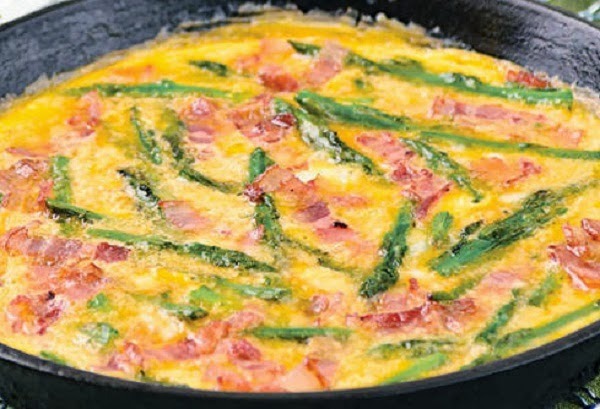 Open-Face Omelet with Asparagus and Bacon is so cheesy, so creamy, it melts in the mouth and slides down with the magnificent sensation one feels when partaking of a truly special gastronomic feast. Breakfast will never be the same again after this. 2. Snap off and discard tough ends of asparagus. Cut asparagus diagonally into ¼ inch pieces. Whisk together eggs, salt, and pepper in a bowl. 3. Heat oil in a 20-inch non-stick oven-proof pan over medium heat. Add bacon, and asparagus, and cook, stirring occasionally, for 2to 4 minutes or until bacon is thoroughly heated and asparagus is crisp tender. 4. Reduce heat to low and add egg mixture. As egg mixture starts to cook, gently lift edge of omelet with spatula, and tilt pan so uncooked portion flows underneath. Cook 2 minutes or until almost set. 5. Sprinkle oven with cheese. Wait for 1 minute or until cheese melts. Remove from oven, and carefully slide omelet onto a plate. Garnish with fresh basil.